PRESIDENT Michael Sata says he is happy with the peaceful environment prevailing in the country. And ZAF commander Lieutenant Erick Chimese said the defence wing has been continuously striving to modernise itself through training of quality personnel in order to attain capability to conduct conventional and sub-conventional operations in joint and multinational military set ups. The president says the country has in the past two years enjoyed peace and stability. 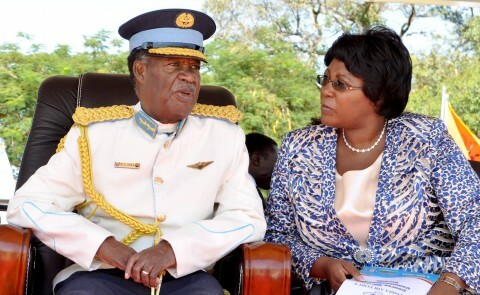 President Sata has commended the defence and security wings for their commitment to duty and loyalty and loyalty to the country. ZANIs reports that the Republican President said at a commissioning parade of 100 graduating officer cadets at the Zambia Air Force(ZAF) Livingstone Air Force Base. Defence minister Edgar Lungu, Secretary to the cabinet Rowland Msiska, southern province minister Daniel Munkombwe and Chief Mukuni also attended the commissioning parade. And speaking earlier, ZAF commander Lieutenant Erick Chimese said the defence wing has been continuously striving to modernise itself through training of quality personnel in order to attain capability to conduct conventional and sub-conventional operations in joint and multinational military set ups. He said ZAF fully acknowledges government’s unwavering support towards the modernisation programme over the years as can be seen from efforts being made towards the acquisition of air assets as infrastructure development. The ZAF commander expressed gratitude to government for the efforts it is making in addressing the critical shortage of accommodation for personnel. Lieutenant General Chimese also said ZAF takes pride that it has to a large extent localised training of its personnel with. ZAF academy as the main source of human resource in the officers’ corp.
prior to this, training of much needed human resource was done abroad at huge cost. There is no reason to fight.